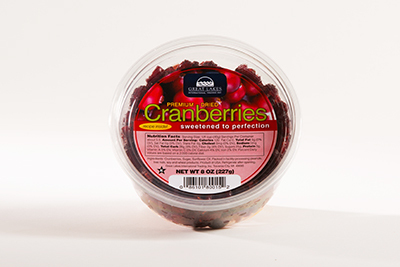 Premium Dried Cranberries: 8 oz Vac Pack Tubs « Great Lakes International Trading, Inc. Sweetened to Perfection! 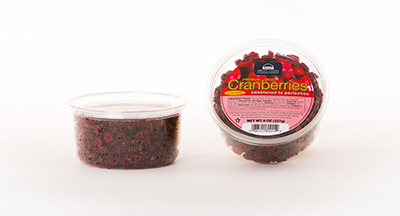 Dried Cranberries are available in a convenient shelf-ready display pre-packed with 12 individual 8 ounce resealable tubs! 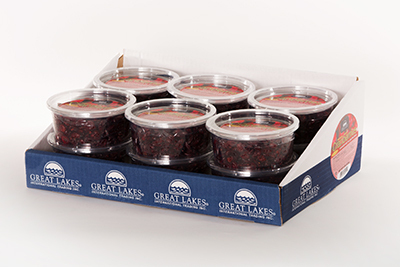 Each tub has a vac pack seal with a reclosable snap lid and is is labeled with complete nutritional data, UPC code, Star-K’s kosher and a recipe suggestion. UPC code #0-86101-80015-2. Product of Canada. Great Lakes item #562. Each carton contains 12 x 8oz. net weight tubs. Each carton measures 16” x 10.5” x 5.5.”, which equals .53 cu. ft. The net weight per carton is 6 pounds. Each pallet is loaded 10 block/10 high for a total of 100 cases per standard 40 x 48 pallet.